Bash Cam Newton if you must, but what do you expect? It’s OK to dislike how he acted, but it’s not OK to believe everyone has to act the same way to fit some predetermined criteria of what a “stand-up guy” does. Cam Newton is fine. It’s fine. I had a lot of thoughts on Newton, but then Albert Burneko at Deadspin pretty much wrote everything I would want to write, and did a really good job of it, regarding Newton’s not-so-chatty news conference appearance after Sunday’s 24-10 Super Bowl loss. He wrote it even before all the chatter about what set Newton off — Denver’s Chris Harris was in an adjacent media area while Newton was talking and could be heard loudly bad-mouthing the Carolina passing game — but even that doesn’t really matter to me. His actual job is to live out an eight-year-old’s dream birthday party on television; if your search for sophisticated adult contemplation has brought you to the postgame presser of the Super Bowl, I submit that you have conducted it, well, rather like a 13-year-old might. I grind my teeth in bed if a stranger on Xbox Live frags me in a video game with what I regard as an overpowered pistol. 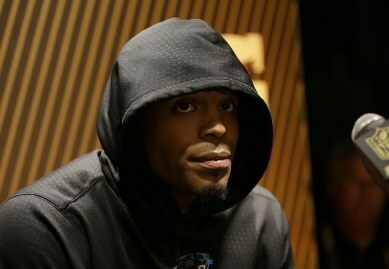 Cam Newton blows off postgame pressers when he gets pressured 34 times, sacked six times, and loses the Super Bowl. Maybe you, just to grab an example, misidentify as an informed critique of leadership qualities your own professional pique or personal distaste. There’s all kinds of sore losers, man. My added $.02 would be that we tend to want our athletes to behave in certain ways, and I’m not really sure that’s fair. We’re all humans. We all might react to losing the biggest game of our lives in different ways. If you’re tossing around notions like Newton failed to show “class” or “leadership,” or even if you’re upset that he didn’t “face the music” because “if you’re going to be there for the praise you have to be there for the criticism,” then maybe just take a step back and examine your definitions of those things? It’s OK to dislike how he acted, but it’s not OK to believe everyone has to act the same way to fit some predetermined criteria of what a “stand-up guy” does. He and a lot of his teammates played like garbage in a game they probably win 7 times out of 10. That hurts. I’m not sure I would have felt like talking, either.